I decided to weave some beads onto a piece of string, but Alexander had a tough time getting them off without help. That activity wasn’t even completed, and that’s okay! Now I know it’s a little too advanced for the time being. We’ll revisit it in a month or so. 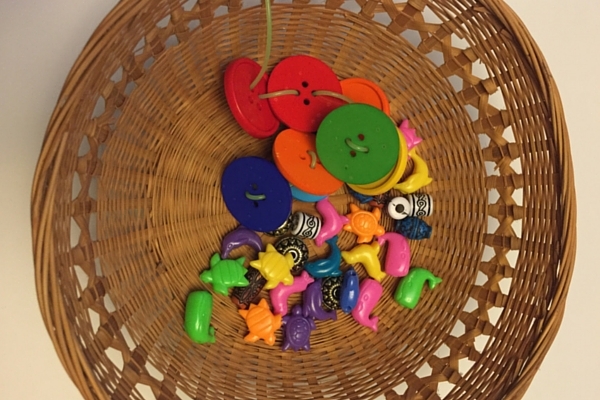 Another activity we did with the beads and buttons was this one. 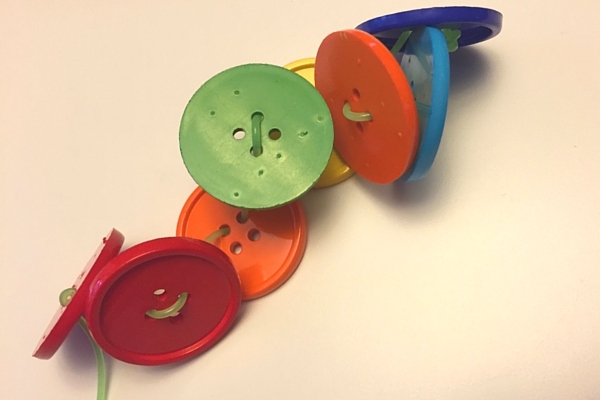 I put a series of beads and buttons in 3 colors (shades of red/orange, shades of blue, and yellow). 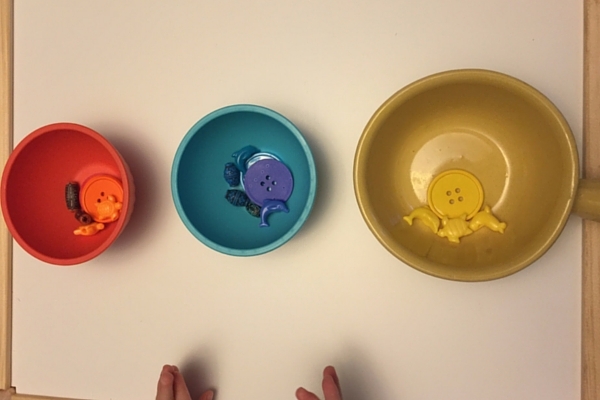 Alexander simply removed the bead or button and placed them into the correct bowl. Some of them were orange, and he refused to put them into the red bowl. That’s okay with me! I filled the bowls so you can see what it should have looked like. Ultimately, he really enjoyed this one! 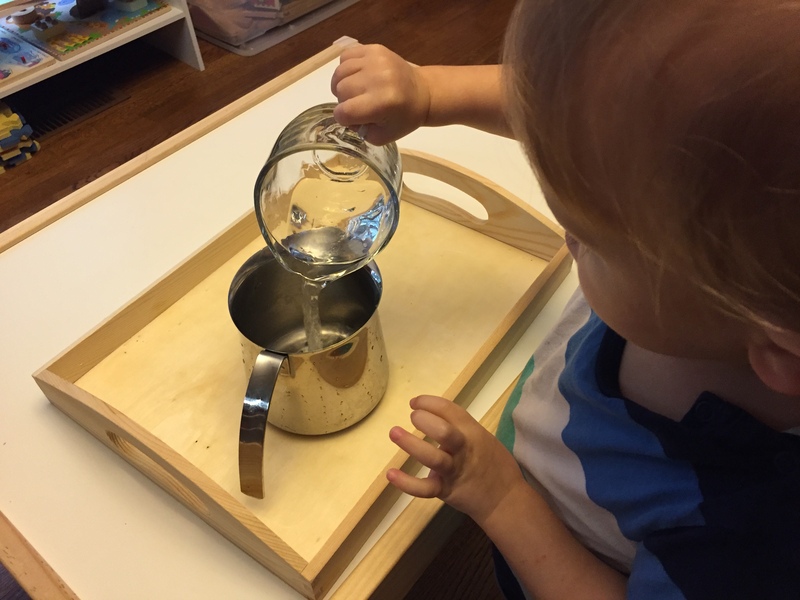 Part of my weekly plan was to practice pouring water and scooping rice. Turns out, rice is just too tiny and I got nervous! 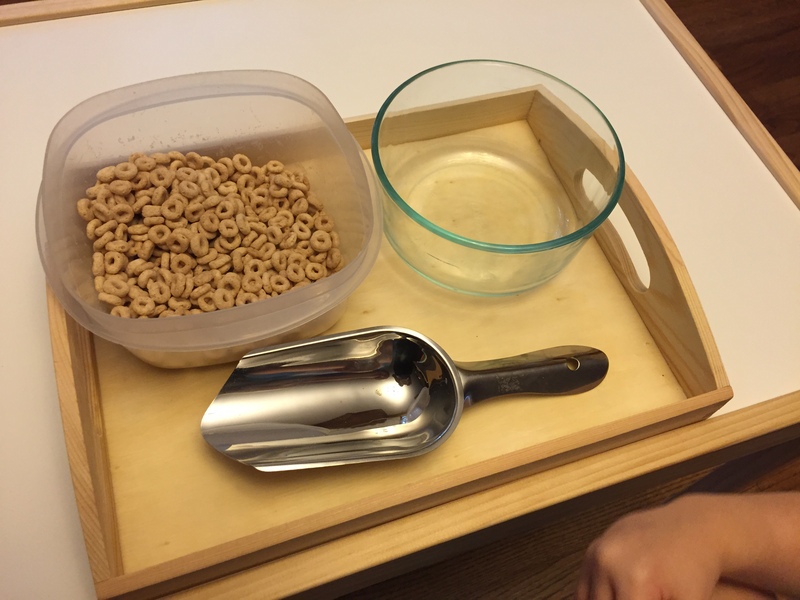 So we used Cheerios instead. Of course, he started eating them instead of scooping them. That part of the activity turned into snacktime. Woops! There’s a video of him pouring the water. He did get better as time went on, but really, that glass pitcher is a bit too heavy. He’s not able to easily pick it up with one hand. I’d like to find a child-sized water pitcher somewhere that’s lighter weight. If I do, I’ll let you know where I got it. 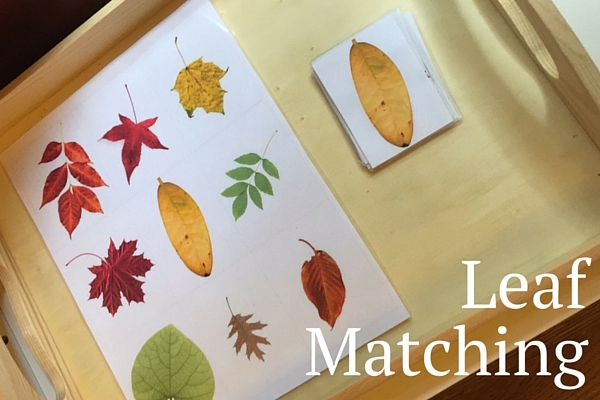 I’m in a handful of Montessori Facebook groups, and in Montessori Homeschooling, a mother shared a whole setup of Fall-related activities. There were so many great ideas, and I thought this was a simple one I could easily use here at home. 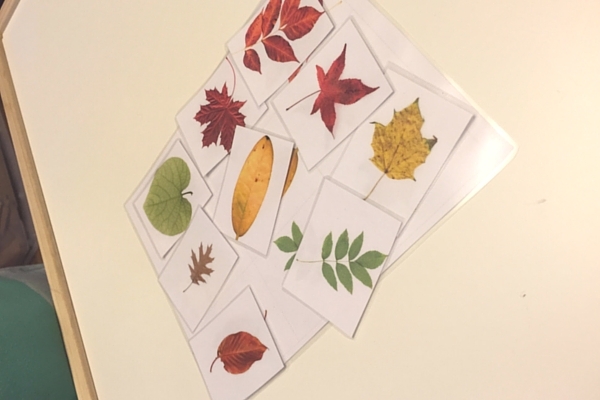 It’s simply a series of 9 leaf images, different colors and shapes. And then, there is a separate set of those same 9 images, cut into cards. Alexander just places the matching leaves. I made this document into a PDF so you can print it for yourself. You’ll just print the same paper twice, once for the “game board” and again for the individual cards. My suggestion? Print one of them full size, and print the second one at 90%. That way, when you laminate (if you laminate), the cards will be slightly smaller than the game board. It helps keep them inside the lines a little better. HERE is the printable leaf document for you to use if you want! Speaking of laminating, I got new laminating sheets today. They’re the ones that are actually meant for my laminating machine. (I’ve had this machine for about 5 years! And I’ve always used the wrong sheets because it’s what I happened to buy at the time!) It is night and day. Seriously, so amazing. It makes the job so much smoother and straightforward. No bubbles, no wrinkles. Perfect! You can find the links to the laminating machine and the sheets I have in “products” at the top of the page. It’s the Scotch TL901 and the 3ml sheets that go along with it. They’re Scotch Thermal Laminating Pouches, the 8.5×11 size. 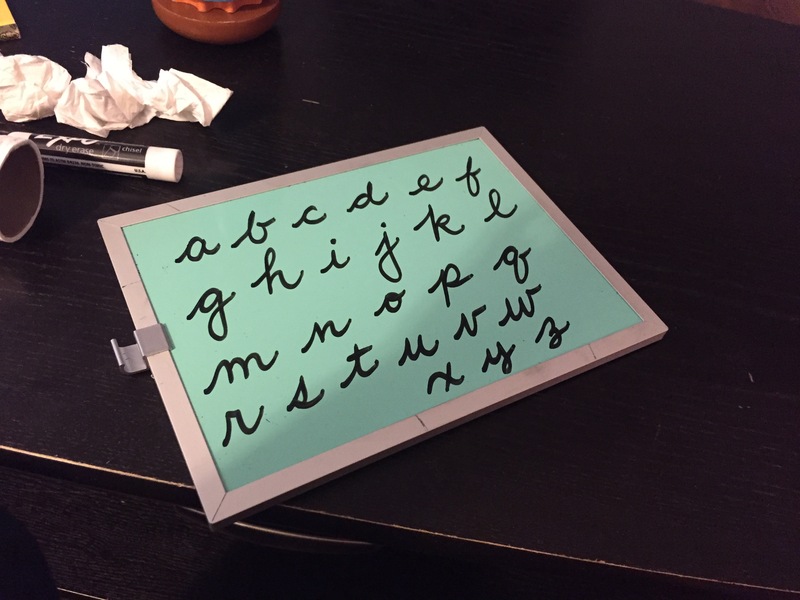 I have mentioned it before, but if you’re new to Montessori, it’s recommended to start with lowercase cursive. We didn’t know that, so we started with uppercase print, then moved to lowercase print, and now we are introducing lowercase cursive. I think uppercase cursive is tedious and almost unnecessary. 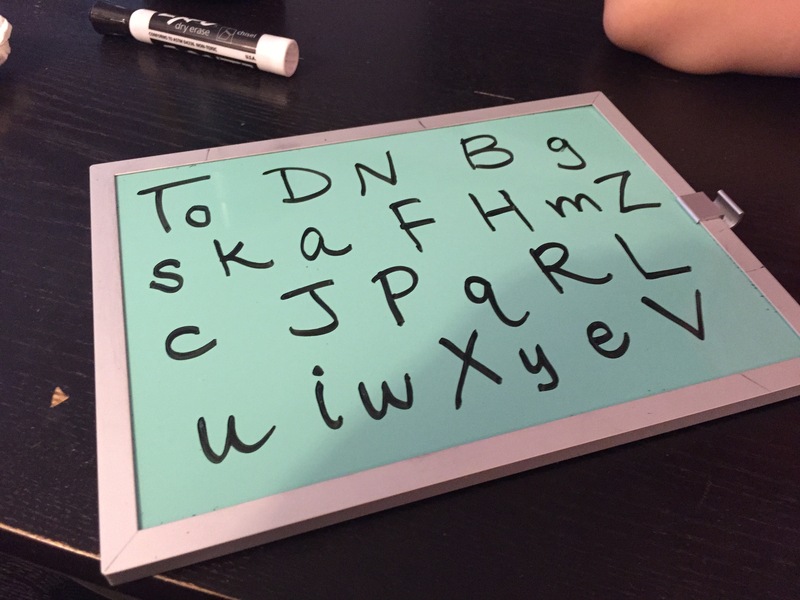 If he really likes learning letters, we’ll do uppercase cursive. But truthfully, when I write in cursive (which is regularly! ), I usually use uppercase print letters to start my sentences. Anyway, we’ll cross that bridge soon enough! In the video above, I’m using a dry erase magnetic board that I got at Target for $3.00. I couldn’t find it online, so I can’t share a link to it! If you have a Target, check those bins at the front of the store that hold the $1 and $3 items! We played this “game” about 20 times (literally). In the video, we’re going through lowercase print letters. I changed how we went through the letters: sometimes, I would ask him to point out a particular letter. Other times, I would ask him to point out whichever letter he wanted. Either way, I erased the letters as we went through them. That way, I could leave the tougher letters for the end (like a lowercase b, d, p, and q, and also lowercase f and t). Here’s what happened if he got a letter wrong: if I said “point to the R” and he pointed to the H instead, I would say, “That’s H!” And then I would say “point to the H” to quickly reinforce the correct letter. I did more than just lowercase print. We did uppercase print and lowercase cursive. He’s lowercase cursive! 2. I also did a mixed version that included uppercase and lowercase print. He did really well with this one, for some reason. He knocked out most of the uppercase first, and then he moved onto lowercase. 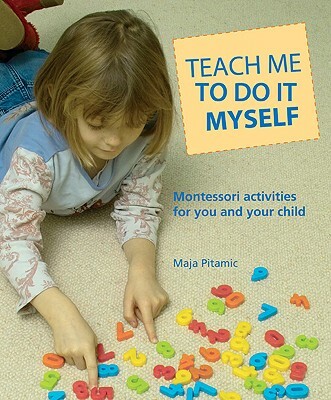 This is a quick review of Teach Me to Do It Myself by Maja Pitamic. I just wanted to share my thoughts on this book I got from the library. It’s a book I may end up buying with my monthly school supply budget. It’s super thorough with a ton of great ideas! I went through the book and took notes on some activities that were appropriate for Alexander. The book is supposedly for ages 3-5, so Alexander is “too young”. 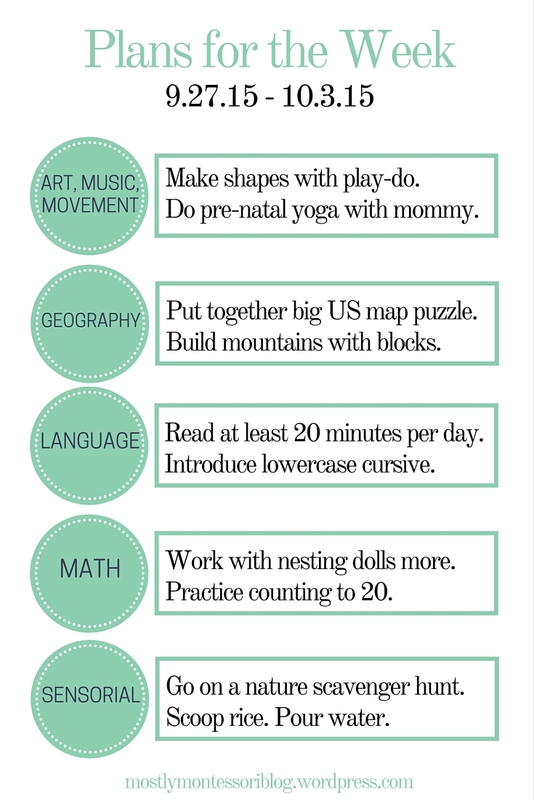 I still found about 15 activities that we can use right now! There are colored photos all throughout the book. 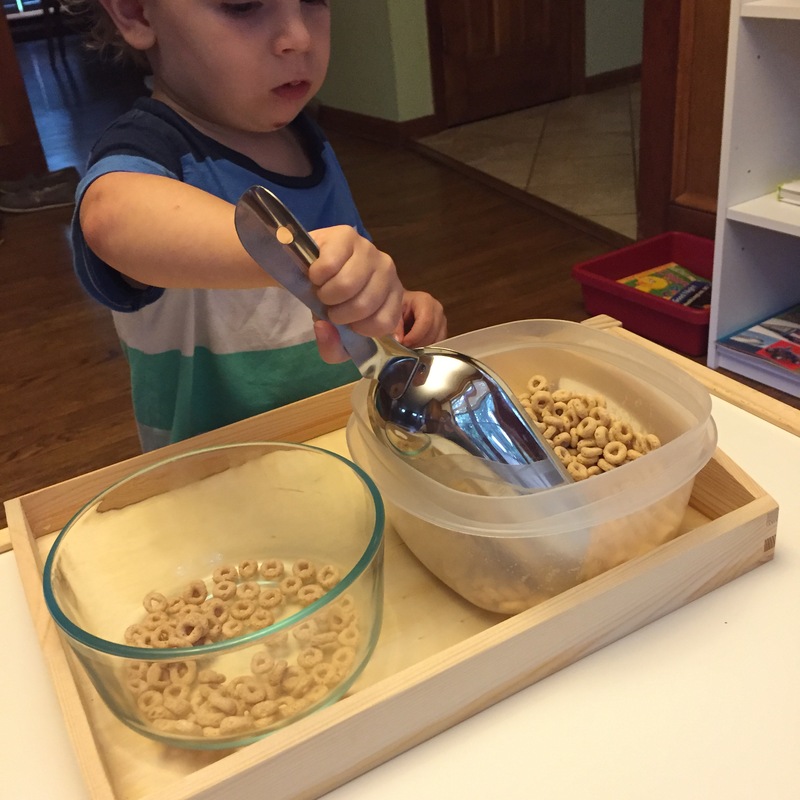 There are extension ideas and “other activities to try” that are similar to the original idea. On nearly every activity, there are tips and safety notes. Additionally in the back of the book are a few worksheets that can be copied and used. If your child is 2-5 years old, I would absolutely purchase this book, if it’s in your budget. There’s a link at the top of the page called Products We Love, or you can CLICK HERE to purchase Teach Me to Do It Myself from Amazon! I stated in the “plans for the week” that I wanted to introduce the USA this week. This floor puzzle is pretty advanced, so we worked together to assemble it. Then, I would remove 5 states while saying their names. And Alexander would put the pieces back in place while I repeated the names of the states. The goal here is just to introduce him to America. I told him where we lived, where his grandparents lived, and where he was born. For now, that’s enough for me. Eventually we would work on different regions (the south, northeast, midwest, and so on) and also talk about government. I assume that will be in a few years. 🙂 But we are going with the flow for now! He’s been to more than 10 states in his short life so far, and we can look at pictures from those trips. Then we can make connections between the state puzzles and the places he’s been. I just want him to get used to the fact that we’re in one state out of 50 states. Funny enough he was born in the District of Columbia, which isn’t a state, but we can talk about that later. That’s the nation’s capital, and that’s a whole other topic! If you’re interested, you can purchase this state puzzle HERE . This is not super fancy or anything! But if you wanted to use these animal flash cards, feel free. Some male and female animals look exactly the same… BUT the way the document is organized, you’ll see a baby, mommy, and daddy of each animal. The paper size that I used was a long skinny sheet of paper. If this is not really ideal for anyone, please just comment. I can make a new document where they’re on 8.5×11 (standard size sheet of paper). I won’t do that yet because, so far, they’re just for us! I printed these, cut them out, laminated them, then cut them again. And I have Alexander match the 3 animals to each other. In addition to the puzzles and activities that are on the shelves already, I want to introduce a few things each week. I am not unreasonable, and I don’t want to push things that aren’t interesting. But without a plan or a goal, we won’t ever move forward! I’m using some of the scope and sequence terms (see “useful links” at the top of the page!) to help guide me. For now, I just want to explore lots of things and take note of what Alexander does and doesn’t enjoy. It could be that we scoop rice all week, and if so, that’s fine with me! I decided not to organize this by days of the week because that will cause me some anxiety. If I have a plan to get something done on Monday, and it doesn’t get done, I add it to Tuesday. Then Tuesday has extra things to do, and I end up falling behind. Ultimately, the goal of this weekly plan is NOT to get a certain number of tasks done each day. The goal is to expose Alexander to as many different topics as possible so that he can decide what he finds interesting. I’m expecting another baby, and I keep meaning to do yoga here at home. My husband Cameron has been doing Crossfit for a while, and Alexander has started to mimic some of the movements (like pushups and situps). I figured we can try doing yoga together, even for just 5 minutes. He might like trying some of the movements with me. He can even have his own mat, which he may like! We’ve got a giant floor puzzle of the USA. Alexander has gotten very good at jigsaw puzzles, so this could be fun for us to put together. And I have a feeling he will want to do it again and again and again. While we’re putting them together, I can point out where we live, where he was born, where his grandparents live, and so on. I figure that mountains are easier to build than some other natural structures. We can build mountains with play-do, blocks, pillows, and so on. Maybe this week, he will learn the word mountain! We also live near a small mountain. If the weather is nice, we can go for a hike and talk about the things we see on the mountain. I’ve gotten lazy about reading to him. I should make it a point to read several books, at least 20 minutes each day. Since we started backwards (with print letters instead of cursive), I want to introduce cursive letters this week. I might try to make some cursive flash cards, unless I can find them online. Eventually I want to purchase the sandpaper letters for lowercase cursive. I’m not sure when he will be able to write letters anyway. 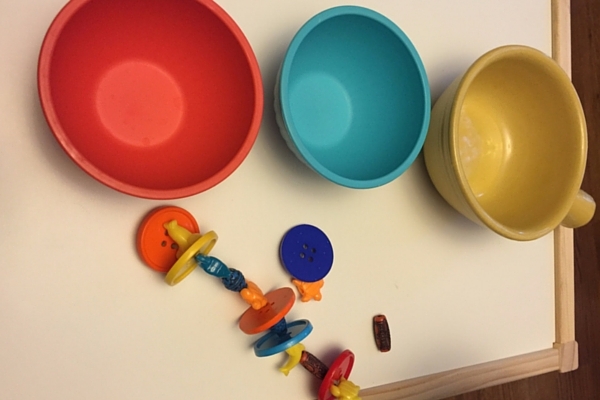 I stated in an earlier post that he likes putting nesting dolls together, but he only puts the tops with the bottoms (and doesn’t nest them). 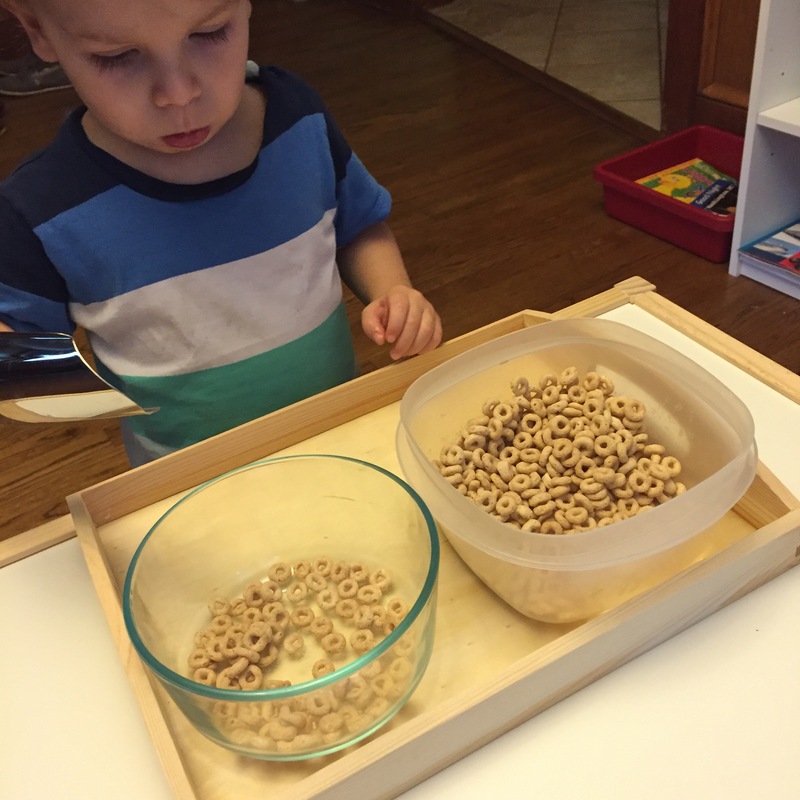 I want to demonstrate the nesting aspect and see if he can figure that part out as well. He can count to 13 already. When I say 14, 15, 16, and so on, he’ll copy me, but after 13, they all sound the same! We can try counting to 20, during diaper changes, while we climb the stairs, etc. In the back yard, I want to hunt for sticks and rocks. He loves finding sticks and telling me which letter it looks like. So we can find a Y-shaped stick and an L-shaped stick and so on. Finally, I want to set up a rice-scooping station and a water-pouring station. I don’t think I’ll keep them out at all times because they’ll be messy. 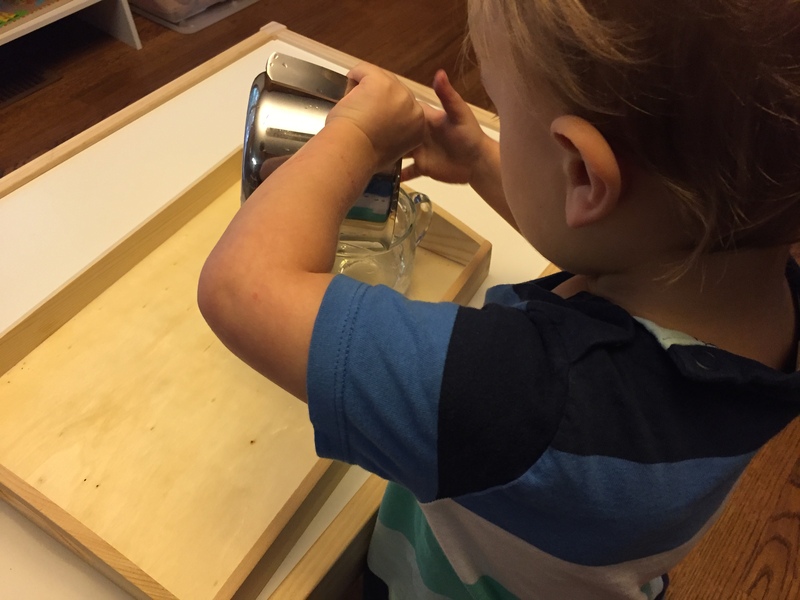 But it would be a fun activity for him, just to practice scooping/pouring from one container to another. It takes a lot of concentration! He has been helping me with cooking more, and he’s gotten better and dumping flour and milk into the bowl without making a mess. This will just help to strengthen that skill. Here’s a quick video of Alexander cutting a banana, for a snack. He’s using a butter knife (a butter spreader?). He’s working on coordination. Bananas are easy for this because they’re so soft. I’m not totally sure what he is learning here, but we’ll call it a sensory experience. He’s having to balance when he walks or crawls on the pillows. And he may be imagining a load of things that he just can’t express yet. This is good for a lot of ages!